The KEGS website. We offer specialist provision for able students. Having always been a comprehensive school student and then a comprehensive school teacher for 17 years, I still feel like an observer rather an insider now that I work in a selective school. I am challenged on the validity of selection by testing from time to time and, as I work very closely with colleagues from a range of school types, it is an issue I am happy to debate and discuss. Having seen both of my children through the school choice circus, I have a parental perspective too. (You might have missed this post on the whole school choice open evening circus). It is fundamentally incompatible with creating a cohesive society; it is reinforcing a sheep and goats social sieve; the ‘social mobility’ claims can’t be substantiated; the nature of testing is flawed and only certain abilities count; testing acts as a social selection because affluent parents can more easily afford coaching; some selective schools cream off talent to the extent that neighbouring comprehensives are essentially secondary modern schools, disadvantaged beyond what is reasonable; fully selective areas do not show significant overall levels of increased attainment; 11 is too young for children to experience failure/rejection. This argument is often put to dampen the enthusiasm anyone might have to open new selective schools; it can also be put to suggest a policy to close grammar schools or, more accurately, to remove their selective admissions policies. This is part of the movement to promote the idea that all children should go to the local school so that, in so doing, we would have a more equitable, integrated and fair society. The arguments are also put forward to help contextualise the performance records of non-selective schools; if you start off by selecting the intake, then no wonder the results are so high and so on. I fully understand all of this and I believe it is an important debate to have. However, it frustrates me that the debate is often too polemical and too limited. People (including me) tend to argue from a perspective that justifies their decisions as parents and teachers; radical idealistic policy suggestions are all too easily made when they’re never likely happen in practice given the range of public opinion among the electorate (this includes the idea of abolishing independent schools as if any government could control how people spend their money to this degree); selection by testing is often isolated from a myriad of other factors when, in truth, there is always selection at work (see below). For me the biggest issue, is that the admissions debate is a sideshow relative to talking about educational standards and the difference we could be making by focusing on classroom practice. Of course, not everyone who wants a place can have one but does that mean that free education like that on offer at KEGS shouldn’t be available in the system? Should it only be an option for those with the money for private schools? Education isn’t a redistributable asset. One person’s excellent education doesn’t have to come at the expense of another; you can’t share it out like money. But, I feel my school shows what can be provided and a great deal of what goes on could be transferred elsewhere, without the selective intake, if people set their sights higher. (Again, this doesn’t go down well but I believe it is true.) The goal should surely be to provide the same level of expectations and curriculum elsewhere and reduce the unevenness in the system that way; level up, not down. As Tony Blair and Andrew Adonis agreed at the start of the New Labour government, there is nothing to be gained from closing down successful institutions. In a democracy, it will never be acceptable and, pragmatically, it isn’t sensible. The same attitudes prevail today and so, in short, closing selective schools ain’t going to happen and, therefore, it’s a fruitless discussion. The battles of the 1970s are over and with a history dating back to 1551, I actually feel that KEGS, and schools like it, deserve to be protected and preserved, provided that they continue to deliver; and we do. However, if it is argued that selective admissions should be phased out, it is worth considering the impact. KEGS is one of four selective schools out of 79 secondary schools in Essex Local Authority. 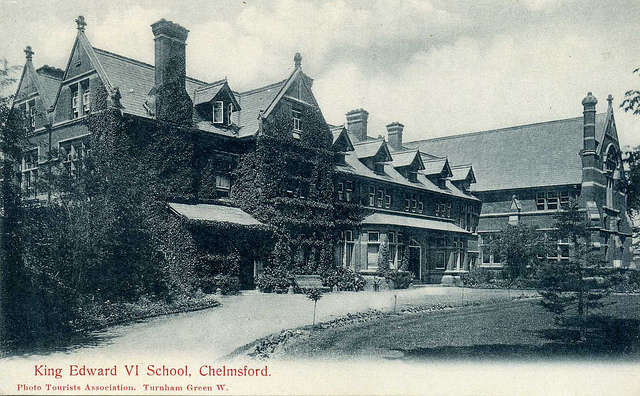 From our intake of 120 into Year 7, only about 50 come from the town of Chelmsford, who might otherwise have gone to 7 or 8 local schools. Our admissions area, from which 80 % of places must be offered, is 25 miles wide; 20% of places are offered further afield. If KEGS became a non-selective school, we’d be taking all 120 students from the town (an additional 350 students over five years) which, in my view, would have a significant negative impact on the local schools as well has having an impact on the local housing market. I think the balance of numbers in Essex works very well; no one school suffers a creaming effect of any magnitude and the local schools have the full ability range. My school sits among them offering a unique form of provision as part of the overall offer in the area; it’s a balance that has evolved over many years and I think it works. Another important factor is the issue of diversity. My school has a BME intake of about 35 % overall. This is three times higher than the local average; I think KEGS has a good shout for being the most ethnically diverse school in Essex. Diversity takes many forms and I’d suggest that my students experience a form of diversity that my own children, despite being in North London (comprehensive but socially selective schools) do not experience to the same extent, especially when they go into their ability groups. One of my biggest frustrations with the ‘local school’ argument is that proponents very often gloss over the realities of de facto house price selection. In the scenario where everyone went to the local school, using proximity measures alone, school choice would be entirely determined by the housing market – in terms of renting or buying. In my area of North London this is significant. The same is true in parts of Essex and all over the country. Taking all other selective factors away, the key determinant of school choice is how much you can afford to pay for where you live. Arguing the local school case, is arguing for housing market selection; there is no escaping that. I know for a fact that many of my students come from families with incomes that mean they could not afford to go to my school if they had to buy or rent a house in the area if we became non-selective. I also know that people choose to rent small flats without gardens in Muswell Hill to gain access to the local school when they’d rather have bought a house with a garden somewhere cheaper. Only people with serious money get to have both. This is the reality of the ‘school choice via Estate Agent’ system; it serves the wealthy to a far greater extent than any issues to do with general affluence, coaching and cultural capital; the sums involved are straight forward to compare. In Essex, there are situations where the school profiles are radically different in different parts of the same town, far away from the influence of selective creaming. School choice by housing is literally how things work and I’d suggest that the ‘choice’ to stay in some areas is not one many local school campaigners would make gladly and they’d move if they could afford to. There are plenty of parents in many parts of the South East who choose to stay in relatively low cost housing but spend their money on private education or extra home tuition. They are scoffed at but I’d suggest that they’re often spending less than people buying the £800K ++ homes in North London that enable people to go to the better local schools – or, to be more accurate, the school of their choice. Another element in the debate is the role of faith schools. The Sutton Trust report from 2008 showed that, of the 100 most socially selective schools in England, based on a measure derived from comparing school vs local Free School Meals rates, only 17 were grammar schools. (See Chapter 7) 53 were voluntary aided faith schools and the others were comprehensives. None of the 20 most socially selective schools are grammar schools. The report suggests that faith schools have a significant impact in terms of social selection. To me this is important; when selective schools are being evaluated, it is obvious to me that any debate has to include faith schools. As an atheist – where, by definition, I don’t believe in a supreme being – it is odd to me that gaining access to schools can be determined by demonstrating faith in something that isn’t real. Now, I know lots of religious people extremely well and I respect them for having their faith; I’m well aware of the place religion has in our culture and history and there is never likely to be a political agenda to remove faith schools from the system – but when one child gains access to a school instead of another because of their parents’ stated faith allegiance, and when this extends to employing staff too… I obviously feel I have less to defend in my own position as Head of a secular selective school. Imagine if we had humanist schools…..
A recent Sutton Trust report on social selection in comprehensives attempted to suggest that new converter academies were more socially selective than the average and less so than the original sponsored academies. To me this was simply self-referential data-truism. These academy types had initial origins in ‘Outstanding’ schools (converter) and ‘schools in challenging circumstances’ (Sponsored). By definition the FSM characteristics of these schools on average would show divergence. The same logic is applied to selective schools; yes it is true the selective schools have proportionally fewer students on free school meals. Why? Well.. take a look at the ‘top table’ in any Y6 classroom – or the average of all Y6 ‘top tables’. Take a look at the demographics of the top set in any comprehensive school. What do you find… ? Of course there is a deep and well-established correlation between attainment and socio-economic advantage. You find this in reception classes. The 2008 Sutton Report actually shows that the level of social selection at selective schools is no greater than that explained by academic selection alone; grammar schools don’t add additional social selection beyond the act of testing. The issues pre-date arrival at the schools themselves and as I’ve argued elsewhere, stopping gaps emerge should be our priority because narrowing gaps is a false promise. The good old Grammar School days?.. Much has changed; much is the same. I know all the stuff about the Halcyon days of grammar schools, where ordinary boys were able to become socially mobile, is often overblown. But it certainly did have that effect for hundreds of students at my school over the years; they tell me so and still we have students gaining that benefit. That said, even if my school now largely serves a middle class ethnically diverse, elite, I’d still argue that it shouldn’t be necessary to limit educational experiences like my school offers to those who can afford private education. KEGS is like an Oxbridge College for kids… but it’s free and is far more equitable in terms of entry than either Oxford or Cambridge. I can live with that. So, on the basis that ‘something should be done’, we need some solutions. Here’s where I’d start. Freeze changes to school structures, but make all schools funded on the same basis with the same freedoms. I don’t think adding more schools necessarily solves underlying issues in the system – so far, there is no evidence of that. However, we should give Local Authorities overriding school planning powers so that any new provision derives from clear need and references existing provision with the potential to improve. If that includes a strategically placed school like mine, so be it – but that that needs careful planning and consultation not just the drive of some local power-players. Focus on school improvement; however hard it seems, with some schools in much more difficult circumstances than others, leveling up is the only justifiable course of action. Raising expectations is at the heart of this. Probably all schools have some students just as talented as mine – so give them the same curriculum experience and set the same expectations. I’m not saying it’s easy…..but people want to come to my school for a reason. Explore wider use of lottery and banding systems and other mechanisms that reduce house price selection. This can only really work in certain circumstances – as it appears to in Greenwich and at London Nautical School – and it reduces the school-community link to some extent. (Banding seems like a good idea although the idea of doing too well on a test to get a school place doesn’t seem entirely right… and this is an inherent issue.) However… let’s not have debates that are essentially only arguments for letting the housing market determine school places, unchecked without release valves for those with less financial power. Explore wider use of selection. This doesn’t mean opening new selective schools, but if all schools could offer some or all places on a form of aptitude selection – then, theoretically, all schools might be open to anyone. There might be winners and losers, of course, but this might create mass mobility where house prices were no barrier and we might achieve greater equity overall. It would be worth modeling with different proportions of places allocated by promixity, by aptitude and by banding. Above all, I’d argue that the polemicists need to tone down their arguments in favour of a more considered and rounded view of these issues. Ultimately, it is all a case of relative values and some form of selection over another. Faith? Ability? Wealth? Random? Who is to say which order these should come in…. it’s more complicated than we’re often allowed to admit or discuss. There is no system without selection of some kind and, having arrived to KEGS from ‘the plantation’, I’m confident that we’re making a contribution that the system needs. Thanks for the this very open post about your own school. Last year when trial HE destinations data was published by DfE I decided to examine how local state schools/colleges in my area of South West London fared, centred around Richmond LA where I live. Richmond featured in the media today as one of the top national LAs sending a share of its students to Oxbridge (but then we have 3 high performing private schools in the borough: St Paul’s Boys, Hampton Boys and Lady Eleanor Holles Girls). My conclusion? That as you rightly say selection of all types goes on within the system and not just by ability of students or of their parents to afford their fees/buy houses in the right catchment areas. What interested me was that some less selective schools still manage to beat the odds and do well in getting more of their students to university, assuming this is the best route for them. I was also surprised to see that by far the majority of an admittedly limited sample of state-educated university-bound students in this area didn’t go to London universities or Oxbridge, but much further afield to Manchester, Southampton, Nottingham, Birmingham, Leeds, Sheffield, Warwick and York for example. I’m not sure what the profile is for the private schools but suspect it may well be more Oxbridge/London focused. This could be due to a whole range of reasons, but indicates to me that highly educated young people NOT vested with traditional links to specific universities will go where they think is best for them, assuming they can afford and are prepared/allowed to move away from home. The other issue that came up was the strong drive for routes into medical school, which dominates a lot of the top end of the ability range, and is facilitated by parents who either work in medicine or have a special relationship with it, whatever views their own children might have about doing such a career. That definitely needs to be rectified. I find all your educational posts really interesting and congratulate you on being a Head who still practises his craft.However, the justification for selective school is where we part company severly.Election distorts school and the surrounding catchment areas to the detriment of all the non selective school in the vicinity.It is educational apartheid and has no possible justification except by teachers and parents who gain benefit from this type of system. I think the challenge for you is to transfer your ideas into the local schools and allow others to have the rich diet you nourish your selected boys with.The world outside selection is such a laudable one but given little credence because of the unfair comparison with selective schools. I shall continue to follow your educational posts and put them into practice in my school. a) Do people really feel school choice via the housing market is more fair than various forms of selection? b) Why is it not possible for students of parallel ability to be set the same expectations each day as they would be at a school like mine? It should be possible and I do what I can to persuade people of that. Closing my school wouldn’t benefit anyone..unless the other schools started to match the curriculum breadth and depth. No-one likes to hear that but I’ve been in both positions and I know it to be true. Thanks for this, Tom. In my thirty year career I’ve taught in comprehensive, grammar and independent schools. All present different opportunities and different challenges (for staff and pupils). I wish we could spend less time, energy and angst debating school type and convert that effort into ensuring the quality of education is as good as it possibly can be, in every school (and all can improve). All children deserve this, whatever decisions their parents may have made about their education. I think point a is a completely separate argument; I agree with the you’re comments re house price selection but two wrongs don’t make a right. On point b, it is a slightly circular argument as if the brightest students are not attending comprehensives then comprehensives can’t provide a curriculum and level of expectation for students that aren’t there. I say this as someone who works in a comprehensive school in Kent. There is also the real issue of coaching that you mention and the social selection and perhaps more worryingly massive stress on 10 year old children. 10 years old is too early to be separating students by ‘ability’. I completely agree with your point about some comprehensives not having high enough expectations, yet I also know of grammar schools that don’t. Again, the fact that some comprehensives are not good enough is not an argument for grammar schools. In fact if anything it is an argument against – the expertise in (some) of them could be improving comprehensive schools meaning grammar schools would become redundant. Lastly, I don’t agree with the argument that says you shouldn’t change something that is successful within a narrow set of criteria based on that one individual school. Overall I really believe that the the net effect on young people in areas with selection is negative. Could I finish by saying thank you for your excellent blogs – I have just started getting into this online world and yours stand out as knowledgeable and considered. I just think it is a shame you are at a grammar school! However, best wishes and keep making a difference for your students. I’m a parent governor at a non selective school in a coastal area where 40% child poverty is comparable to Tower Hamlets. It’s clear family background feeds into our education system. The 11+ doesn’t help social mobility. Parents seem to feel that grammar school is the better option, so battles begin at the primary school gates. But we need educational apartheid like a hole in the head. What we do need, and struggle to get, are teachers who live in the area for longevity of placement to meet a range of needs. Regarding many forms of selection. The evidence shows that the first 24 months of life can be game changers, that windows exist until and beyond adolescence and that stimulation in the home can make all the difference. So, if it’s agreed parents can make the biggest difference why aren’t schools doing more to provide extended learning? Why can’t grammar schools and neighbouring schools join forces to provide a ‘comprehensive offer’? And why can’t parents from all social backgrounds take part in debate on education? The entire education argument has in its self become extremely stuffy and elitist. Lots of good and interesting points in both your post and comments, Tom. I agree that other secondaries in the your area have (almost) equally capable students – perhaps in their top 10%. I think it is less easy to argue that those schools could be offering their students a comparable experience and curriculum to yours. Surely, the fact that 90% of their pupils are not at a ‘KEGS level’ – with some well below – is a major handicap? My second point is one that you refer to briefly. If there was a way of better ‘ensuring’ that the most capable children from whatever background got into a selective school, that would be an enormous benefit. At present, I feel that parental affluence, reflected in obsessive tutoring and Prep schools, damages that aspiration. As you will be aware, those that have been coached beyond their capability suffer much as those that never have the opportunity to gain entry when they find that they’re out of their depth. Thanks Chris. I’m acutely aware of the coaching issue. Personally I think the bigger factor (by far) is that parental affluence will have an impact on any attainment measure by the time kids are 11. If you could do a survey of every ‘top table’ or higher ability grouping in Y6 across Essex you’d find a very strong correlation. It isn’t the selection process that introduces this inequity; it is there already. We still consider this issue all of the time and we’re looking at a move that will make our tests more widely accessible; that will be communicated later this term. It isn’t the same move CCHS has made which is unproven to-date. Tackling the inequity has to begin in Early Years, with major investment in parental education where children are behind the rest. I’ve argued this many times. Regarding your first point, of course it is harder even with a 10% overlap. My argument is that if the provision can’t be matched, then the argument for selective schools in a context like ours is stronger; provision like ours should exist in the state system. Of course I am biased, both as Head and as a parent.